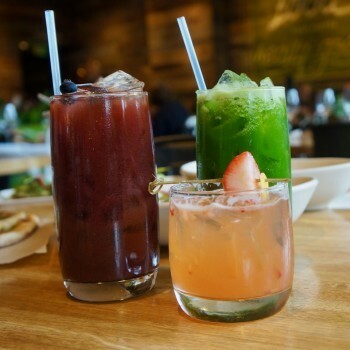 Recently, I was with a group of fortunate food writers who sampled some delicious dishes from the new spring menu at True Food Kitchen in El Segundo in the Los Angeles' South Bay area. 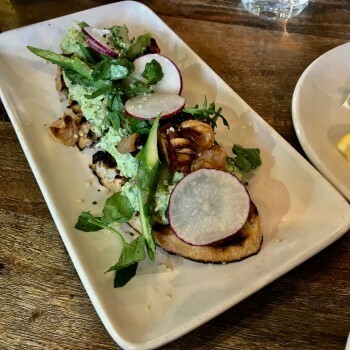 In the past, I had been to True Food locations in La Jolla and Phoenix so I knew how healthy and creative this upscale restaurant group's dishes could be. True Food focuses on nutrient-rich dishes full of fresh, seasonal ingredients that are flavorful as well as healthy. The El Segundo location was no exception. 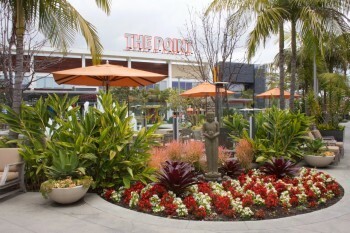 True Food in El Segundo is perfectly located in a chic, open setting at The Point, a vibrant shopping and dining destination highlighted by lush landscaping with flowering plants in full bloom. 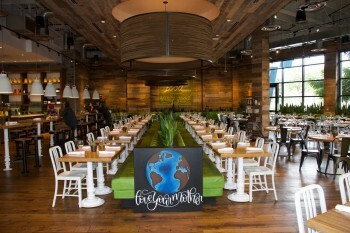 The interior of True Foods is spacious and stylish. We loved the inspiring sayings posted throughout the restaurant—especially "Love Your Mother," which is always good advice. 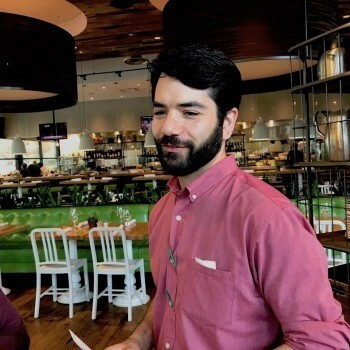 We were greeted by personable Laurence Scher, True Food's General Manager at the El Segundo location. He described each dish we sampled and discussed True Food's approach to providing creative combinations of healthy, seasonal ingredients. There are currently 22 True Food locations throughout the country and much growth is planned for the future. All the locations share the same menu items created by the restaurant's executive chef, but ingredients are locally sourced. True Food was created nine years ago by Dr. Andrew Weil and Sam Fox and is now owned by an investment firm. Scher emphasized that one thing setting True Food apart is its ability to prepare foods for any dietary requests. Many of the menu items are already vegetarian, vegan or gluten-free. 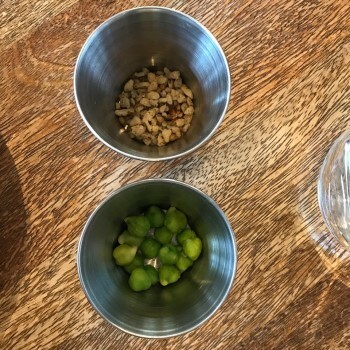 We first sampled two interesting ingredients that True Food is adding to many of its new dishes. The top bowl holds chopped black walnuts, which have great health benefits while also providing strong, aggressive flavor. The bottom bowl holds young green garbanzo beans which were absolutely delicious and so unique. Throughout our tasting, we enjoyed a variety of imaginative cocktails, such as a Basil Cucumber Collins with lemon-infused vodka, cucumber and basil; a Thai Grapefruit Martini (my favorite cocktail) made with organic vodka, grapefruit and thai basil; a Strawberry Smash with bourbon, muddled strawberry and lemon; and Farmer's Market Sangria with organic white wine, spiced brandy, wine and pineapple. The menu also includes an appealing list of excellent wines from all over the world, plus beer and ciders. 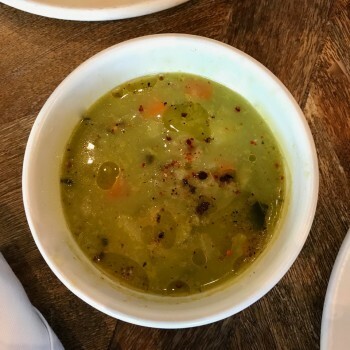 As a first course, we enjoyed Asparagus Leek Soup with lemon oil and Aleppo pepper garnish. It was light with nice, unusual flavors. 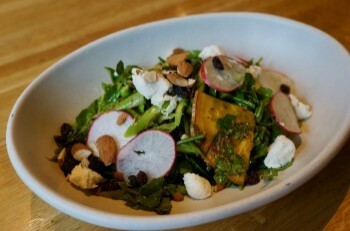 This Seasonal Ingredient Salad was chock full of tasty, fresh ingredients, such as watercress, grilled broccolini, asparagus, green garbanzo beans, goat cheese, raisins, sprouted almonds, tumeric and a refreshing chia vinaigrette. 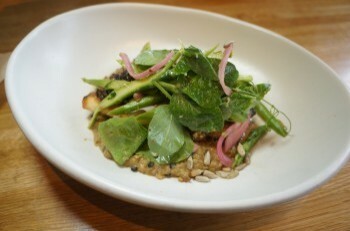 Our fish dish was grilled black striped bass on a bed of blackened red lentils and topped with watercress, summer radish, lemon, garlic and asparagus. The skin was crispy and nutritious. We loved this tender, beautifully prepared fish with subtle flavor. 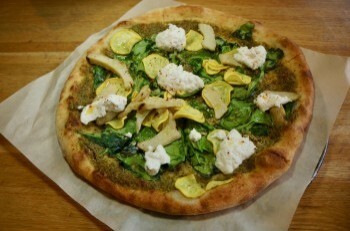 Grilled Artichoke and Pesto Pizza was another vegetarian favorite with spinach, summer squash, black walnut pesto, lemon aleppo chili, and vegan almond ricotta. The housemade crust was crispy and the ingredients worked well together, creating a very special and unique pizza. 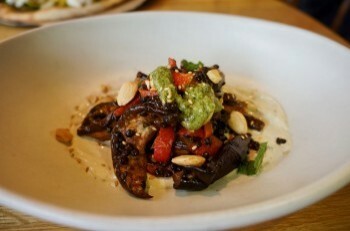 The Miso Glazed Eggplant offered us a surprising combination of flavors with lentils, roasted peppers, almonds, truffles, and tahini yogurt, all accented with black walnut pesto. I am an eggplant lover and have never savored such a creative and tasty eggplant dish. 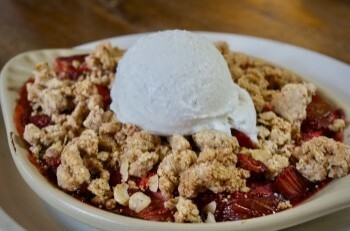 Our final dish was a scrumptious Strawberry & Rhubarb Crisp with crumbled almonds, chia seed and a delicious vegan vanilla ice cream made with coconut cream, rice milk and vanilla beans. 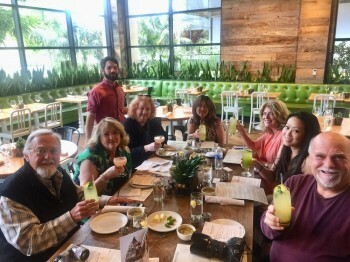 This is our happy group of food writers from the International Food Wine & Travel Writers Association, enjoying wonderful cocktails and dishes at True Food Kitchen in El Segundo, California.